It’s possible that a SIMD implementation (assuming that you routinely pass over enough bytes) can blow this away. I’m not sure what the cross-over point is – it depends on whether you are falling out of this code quickly or not. Obviously using a big SIMD sequence to replace a “2 cycles per byte” implementation is pretty stupid if the SIMD sequence is “0.5 cycles a byte” but the fixed cost of using the SIMD means that your costs are >=16 cycles and the typical case is small. It’s also not clear that you actually need a SIMD instruction – if you’ve squashed your hotspot to the point that adding the complexity of per-platform SIMD specialization is only a small win, then why bother? I’ve been really lazy in writing this up, but someone kindly did a decent write-up for us in the Rust reimplementation of our “Teddy” literal matcher. Please see https://github.com/rust-lang/regex/blob/master/src/simd_accel/teddy128.rs if interested or look up the Hyperscan project at https://github.com/01org/hyperscan for a few different versions of this trick. fast is good, but have you checked your parser for correctnesss? Your null termination problem is an oldie but a goodie. The Ragel state machine generator has a ‘noend’ option to purposely omits bounds checking. If you’re parsing mmap’d memory btw, and don’t want to map it with write permissions, you can always just map an additional page beyond the end of the file. Most OS’s guarantee this will always be zeroed out. Hell, you don’t even have to do this if the file size isn’t a multiple of the page size, since the padding in the final page is also zeroed. yajl	ISC	SAX	Y	Y	815/120	249 MB/s, 5.1 s	Y	Large code base. 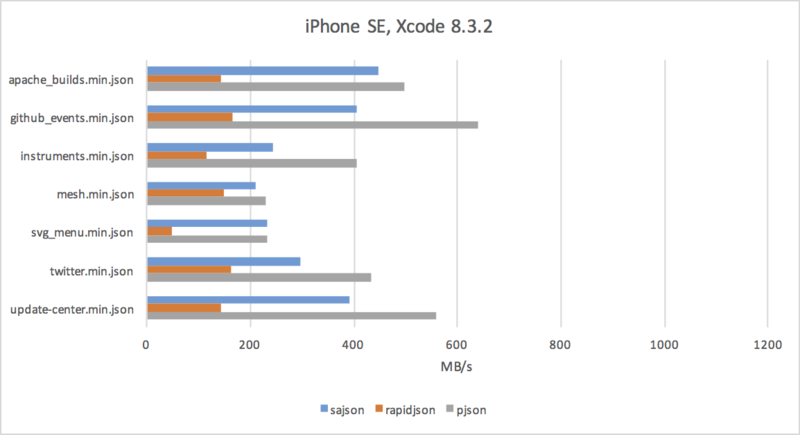 jsonsl	MIT	SAX	N	Y	10/2	246 MB/s, 5.6 s	Y	Tiny source code base. json-parser	BSD	DOM	N	Y	276/24	49 MB/s, 12.4 s	Y	Tiny! A single source file. 482 MB/s, 2.3 s	Y	Tiny! I’ve been wanting to write a JSON stream parser for a while. By the time the last packet arrives, the rest of the JSON will already be parsed. 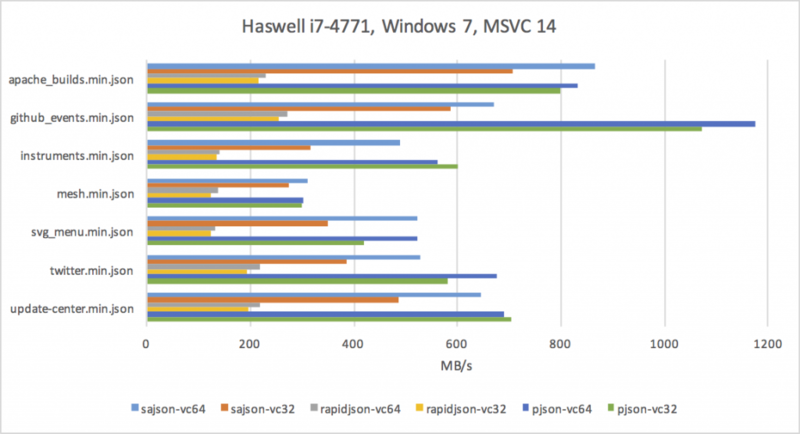 We have some large queries that download a few megabytes of JSON. 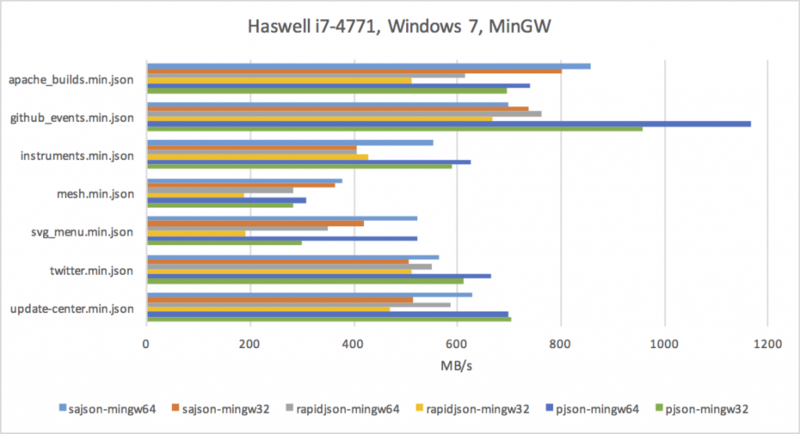 It looks like CPUs and memory are getting fast enough that it may no longer make sense, though. 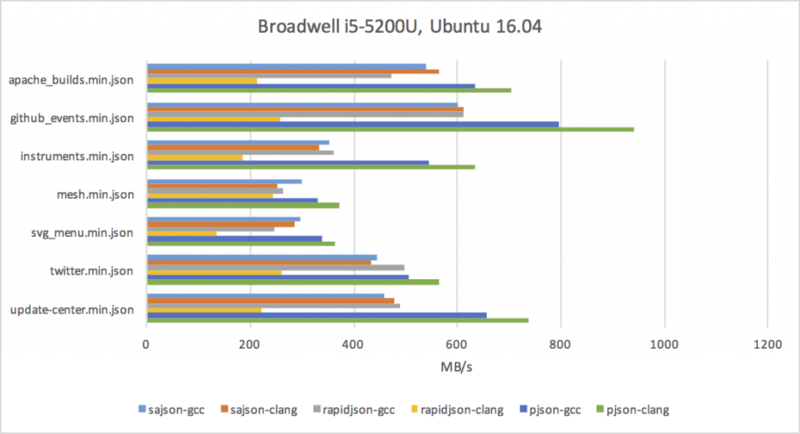 It would be interesting to see performance on this benchmark. Chap here does use sse2 instructions if I recall right, and he is faster than RapidJSON. I’ve experimented a little with CSV parsing using AVX2, and had some good results, mainly on wider files. Specifically, I take the approach of doing a single preparse to produce a bitmap of places where there are delimiters. Can then parse the file in a normal loop more efficiently. No formal results as it doesn’t yet have complete correctness, but initial testing looks promising. I’m not sure how JSON would go. I ran sajson with my [JSONTestSuite](https://github.com/nst/JSONTestSuite) and found it to be pretty good, except that some non-numbers are erroneously accepted as numbers. 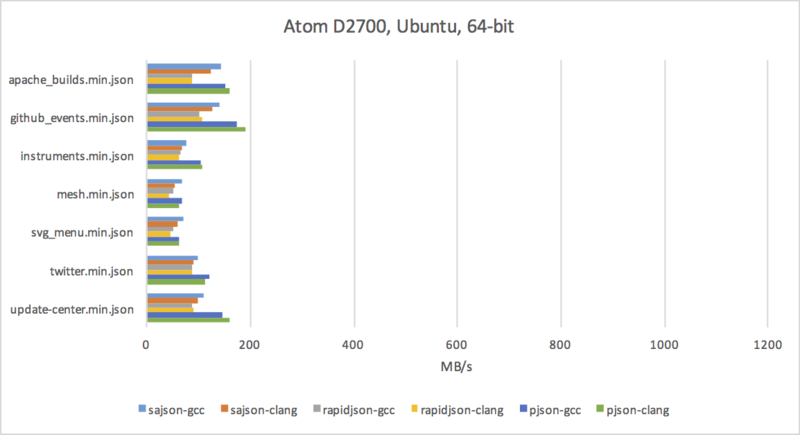 I did benchmark of sajson, RapidJSON and gason using RapidJSON’s nativebenchmark. The results were consistent with the Dell XPS 13 graph above, except that in my hands rapidjson-clang is comparable with others (here it’s much slower than rapidjson-gcc). The message is that the cycle count from Cachegrind that is only a proxy for actual performance, but is more repeatable than real timings, is actually better for microoptimizations. Because in this case repeatability is more important than accuracy.